Living on campus and taking advantage of the many resources available to you while at the University of Rochester is part of the experience. First-Year students and sophomores are required to live on campus for this reason. According to the American Council on Education, college students who live on campus are more satisfied with their experience, earn higher grade point averages, and are more likely to graduate. There are many worthwhile options to choose from during your student years, both within the Residential Life system and in our community neighborhoods. We provide safe, clean, furnished rooms with comfortable surroundings. Our main priority is to ensure that students are provided with an opportunity to have a community of peers, experience mutual respect with a roommate and a hall, share learning experiences with hall and floor mates, and get involved with the many University-wide activities and opportunities available. Upperclass students have many housing options at the University ranging anywhere from Hill Court, Jackson Court, Burton and Crosby, Southside, and Riverview/Brooks (Juniors and Seniors Only). As Upperclass students, we invite you to become engaged in building a healthy and supportive community in the residence halls. We encourage you to read the Residential Life materials carefully. They are designed to help you prepare for living at the University of Rochester. If you have any questions, don’t hesitate to visit us at the Residential Life Office in 020 Gates Hall (Susan B. Anthony Halls), call (585) 275-3166, or email us at housing@reslife.rochester.edu. If we do not have an answer for you, we will either find it or connect you with someone who does. Would you like to request a room change? Upperclass students can stop by the central Residential Life Office located in 020 Gates Wing, Susan B. Anthony Halls, to fill out a form. 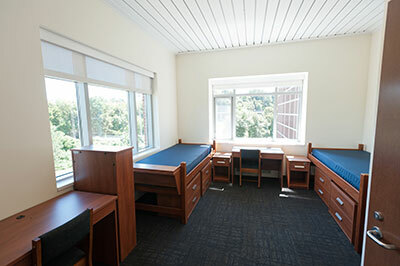 The Office for Residential Life and Housing Services is in office 020 in the Gates Wing of Susan B. Anthony Halls. Come visit us if you have questions regarding housing options. Fraternity and Sorority Affairs, in Wilson Commons 510, can provide information related to living in the fraternity or sorority houses.